Why is it important to understand the symptoms related to Lyme disease? If left untreated, Lyme disease can last for years and cause both neurological and musculoskeletal damage. In some cases it can lead to heart infection and death. What exactly is Lyme disease? Lyme disease is a bacterial infection (Borrelia burgdorferi) transmitted to humans and pets through the bite of infected Ixodes ticks (known more commonly as deer ticks or black-legged ticks if you live in the West Coast). These small arachnids are normally found in wooded and grassy areas, which accounts for the vast majority of the U.S. This explains why Lyme disease is prevalent in more than 60 other countries and found on every continent except Antarctica. Here in the U.S., it is estimated that 300,000 people are diagnosed with Lyme disease every year. 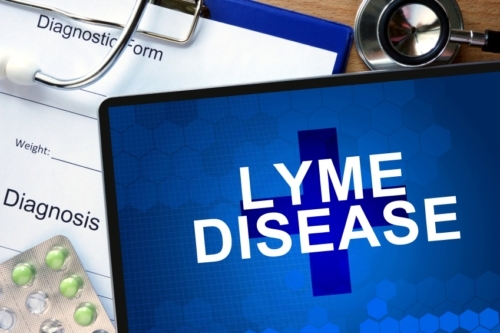 But because it can be difficult to diagnose Lyme disease and the symptoms of Lyme disease can often be misdiagnosed, experts believe the real number is significantly higher. How did the ticks carrying the potential disabling bacteria get here? Blame the birds. Ticks often travel on the feathery bodies of migratory birds or white-tailed deer. When the migrating birds or deer stop to take a break, the ticks fall off and look for new hosts. When they want to feed on fresh blood they climb to the tip of a blade of grass and wait to latch onto someone. A tick can feed on the blood of a host for up to a week. If the tick is infected with Lyme disease, it can take 24 hours to transmit the bacteria. Where ticks were once found in isolated forests, they are now common in densely populated areas. That’s why it’s so important for those who visit tall-grassy, leafy areas to check their clothing and pets for ticks. Once the ticks are established in a location, they never leave. It might take just 24 hours for a deer tick to pass Lyme disease onto us, but the signs and symptoms of Lyme disease can vary. Lyme disease symptoms also usually appear in different stages. It’s not entirely uncommon for the early stages of Lyme disease to be misdiagnosed. That’s because the early symptoms of Lyme disease can feel like the flu. This includes a fever, sore muscles, headache and feeling tired. One of the most obvious signs of Lyme disease is a rash that looks like a bullseye or a bruise. Lyme disease rashes can also look like spider bites, ringworm, or cellulitis. Multiple rashes can also appear on different parts of the body. This obvious early symptom of Lyme disease can start a few days or even a few weeks after being bitten. It then expands over a period of days or weeks, reaching several inches across; sometimes as large as 12 inches. It is typically not painful or itchy. If left untreated, the rash can last for weeks as well as blister or scab over. While it will eventually fade, there is a chance it could reappear. Fortunately, or unfortunately, the trademark rash only occurs in 60% to 80% of all Lyme disease cases. If you do develop a rash that has a ‘bullseye’ shape with a darker edge, then you definitely have Lyme disease. But again, this distinctive sign of early Lyme disease occurs in less than 10% of people who contract Lyme disease. As you can see though, it’s possible to be bitten and get Lyme disease and never develop a rash. And ultimately, not even be aware you have Lyme disease. So don’t wait to see if you develop a rash before deciding you have Lyme disease. If you fail to diagnose or treat Lyme disease in the early stages, new signs and symptoms of advanced Lyme disease could appear in the following weeks and months. More advanced symptoms of Lyme disease can infect the skin and joints (especially the knees) and cause a stiff neck. This can be followed by severe headaches and shooting pain in your body that can keep you up at night. Changes in your heart rate or palpitations and dizziness are also advanced symptoms of Lyme disease. Lyme disease that has been left untreated for several months can lead to much more serious problems. Including symptoms that affect your nervous system. For example, Bell’s palsy is a neurological complication of Lyme disease and leads to the loss of muscle function in your face. People with Bell’s palsy sometimes look like they’ve had a stroke because they cannot move the muscles on one side of their face. Pain, weakness, and numbness can also spread to the arms or legs. So too is poor memory, the reduced ability to concentrate, conjunctivitis (or pinkeye), or even deep tissue damage to the eyes. While heart problems and inflammation of the eyes and liver are rare, they are possible symptoms of late stage Lyme disease. If Lyme disease is not diagnosed and treated early, the bacteria can spread or go into hiding in different parts of the body. That means the symptoms of Lyme disease can disappear for weeks, months, even years later, without treatment. It can then reappear at different times. Even with treatment, some people suffer from chronic symptoms of Lyme disease. While the bacteria may have been eliminated from the body, it’s possible for some effects to linger. Chronic or late stage symptoms of Lyme disease are similar to those of early stage Lyme disease. That being said, there are important differences. People with chronic Lyme disease symptoms can develop problems with the heart, circulation, brain, nervous system, muscles, joints, digestive system, reproductive system, and skin. Other symptoms of chronic Lyme disease also include extreme fatigue and short-term memory loss. Because many chronic Lyme disease symptoms (fatigue, memory loss, joint pain, restless sleeping, muscle pain, and mood problems) occur in other diseases (chronic fatigue, fibromyalgia, rheumatoid arthritis, multiple sclerosis, depression and Alzheimer’s) many of those suffering with chronic Lyme disease report being misdiagnosed with a different condition. For early stages of Lyme disease, the treatment failure rate ranges from 16% to 39%. Estimates of misdiagnosis for those with chronic Lyme disease are much higher, ranging from 26% to 50%. Living with the symptoms of chronic Lyme disease can be debilitating, causing both extreme lifestyle changes and emotional stress. In fact, many retreatment trials for those with chronic Lyme disease found that the quality of life was equivalent to someone with congestive heart failure. Pain levels were found to be similar to those of post-surgical patients, and extreme fatigue was found to be on par with those with multiple sclerosis. Not surprisingly, those with chronic Lyme disease find it difficult to maintain employment. Over 40% of those with chronic Lyme disease say they are unable to work because of the symptoms of Lyme disease. And 24% say they have received disability at some point during their illness. Lyme disease is not just a bug bite. It can be a debilitating disease that affects every aspect of your life. Especially if Lyme disease is diagnosed late. While advanced Lyme disease may take longer to treat, most people recover completely. The symptoms of early, late, and chronic Lyme disease may cross over to many other illnesses, it’s important to understand how you can get Lyme disease and what the various symptoms are so you can stay healthy. Many of the following symptoms of Lyme disease are indicative or common in other illnesses. That said, the more symptoms of Lyme disease you have, the greater the need to have your illness evaluated. 7. Sore feet – especially in the morning. Sadly, there are no control measures for blacklegged ticks. Irradiating the ticks would have an irreparable impact on the environment. The best thing you can do is educate yourself on Lyme disease. Be aware of your surroundings and the insects around you. Do spot checks for ticks on you, your friends, family, and your pets on a regular basis. If you suspect you may have contracted Lyme disease, contact your doctor or health practitioner immediately. “Lyme Disease,” Center for Disease Control web site, December 2, 2015; http://www.cdc.gov/lyme/. “Lyme Disease,” Government of Canada web site, December 2, 2015; http://www.healthycanadians.gc.ca/diseases-conditions-maladies-affections/disease-maladie/lyme/index-eng.php. “Lyme Disease,” National Health Service web site, December 2, 2015; http://www.nhs.uk/Conditions/Lyme-disease/Pages/Introduction.aspx. “Lyme Basics,” Canadian Lyme Disease Foundation web site, December 2, 2015; http://canlyme.com/lyme-basics/. “Lyme Disease Symptoms,” Lymedisease.org, December 2, 2015; https://www.lymedisease.org/lyme-basics/lyme-disease/symptoms/. “Lyme Disease Symptoms,” lymeneteurope.net, December 2, 2015; http://www.lymeneteurope.org/info/lyme-disease-symptoms. “Chronic Lyme Disease,” Lymedisease.org, December 2, 2015; https://www.lymedisease.org/lyme-basics/lyme-disease/chronic-lyme/. “Chronic Lyme Disease,” National Institute of Allergy and Infectious Diseases web site, December 2, 2015; https://www.niaid.nih.gov/topics/lymedisease/Pages/chronic.aspx. “The Mystery of Chronic Lyme Disease,” Wall Street Journal web site, December 2, 2015; http://www.wsj.com/articles/the-mystery-of-chronic-lyme-disease-1436197582. “Does Chronic Lyme Disease Exist,” usnews.com, December 2, 2015; http://health.usnews.com/health-news/patient-advice/articles/2015/06/16/does-chronic-lyme-disease-exist.